Gov. Bill Walker’s approval rating with voters is at the highest since it collapsed with his 2016 veto of half of the permanent fund dividend, according to additional polling results released this week. The survey results were included in a document released by the Walker’s campaign that covers additional elements of a survey that The Midnight Sun obtained last week. The survey was conducted by Anchorage pollster Ivan Moore’s Alaska Survey Research firm that contacted 761 Alaskans on a mix of landlines and cellphones between March 25 and 29 and was weighted to match the demographics of Alaska. It shows Walker’s approval rating is at a two-year high with a 44 percent of respondents saying they approved of the job Walker’s doing. 35 percent disapproved of his job and the remainder were undecided. 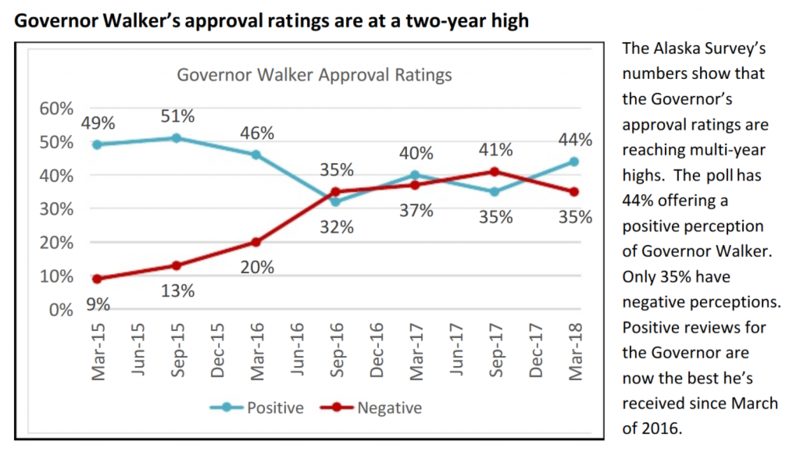 Walker’s initial approval ratings during Walker’s first year and a half in office saw approval ratings that hovered around 50 percent with low disapproval ratings. After the veto of the dividend, however, Walker’s popularity plummeted. In the first polling after the decision, he saw his first net negative approval rating with 35 percent of respondents disapproving of his job while 32 percent approved. In the years since then it’s gone back and forth a bit, but the story has stayed generally the same. The latest polling result, however, shows the biggest improvement for Walker since the veto of the PFD, gaining nine points in approval rating while seeing his disapproval rating drop by six points. The survey’s rising approval rating for Walker is significant given that the permanent fund is almost certainly going to be a pivotal element of this year’s election campaign. A full PFD is the key element of GOP gubernatorial front-runner Mike Dunleavy’s platform. The analysis comes on the heel of last week’s release of polling numbers that showed Walker held an early, but sizable lead over GOP gubernatorial front-runner Mike Dunleavy. 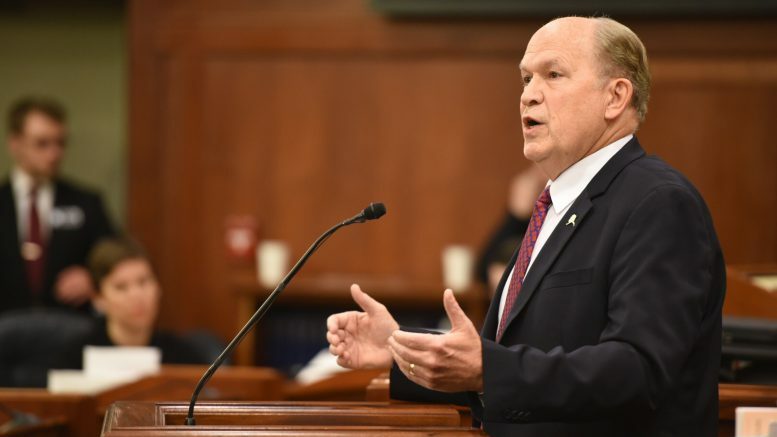 The Alaska Survey Research poll put Walker at a 51-44 lead over Dunleavy. However, the same survey also found hypothetical Democratic gubernatorial candidate Mark Begich would fare even better in a head-to-head match up against Dunleavy with a 53-42 result. The former U.S. senator has teased a potential run for governor, but has not made any recent statements about that move. As always, polling this early in the year is not likely particularly insightful to what might happen in November–these polls are specifically asking about an election that would be held today–but help offer some insight into the information that will be shaping key decisions in the month ahead (the filing deadline for state office is June 1). Walker still enjoys support of one in five self-described Republicans, which is probably the biggest worry for Republicans coming out of these results. Walker’s support among Democrats and independents is at 50 percent each. These groups are also the most likely to be undecided compared to Republican respondents. 2 Comments on "Walker’s favorability is on the rise and highest since PFD veto, according to poll"
Also helpful to Governor Walker’s reelection efforts is a surprisingly weak list of opposing candidates. The thin gruel of potential Republican opponents Chenault, Hawkins, and Dunleavy bodes well for Governor Walker getting elected again. Offer free stuff. Ingratiate yourself with the Native community and marginal Democrats. Put the onus for stealing dividend money upon the Legislature. Appear like a regular guy shoveling snow and riding tractors. Depend on the forgetfulness and/or ignorance of voters. That’s how politics is done.